Azur Games has been ceaselessly bringing us top-notch games since 2017. With a current portfolio that contains 12 games, Azur Games’ most popular apps are City Gangs: San Andreas, BIG BANG Evolution, and Tap Tap Monsters Evolution Clicker. 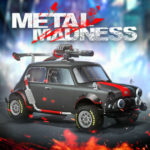 As the company’s games typically make it to top 100 games lists for Android in over 10 countries, it’s no surprise to find their latest release, Full Metal Monsters to easily rake in largely positive reviews and earn over 50,000 downloads in a short span of time. 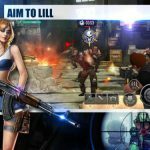 Full Metal Monsters is the first of its kind as a 5-person team PvP action shooter game where a wide selection of dinosaurs and guns make for infinite possibilities in terms of team compositions and strategies. If you enjoy unique shooter MOBA games to play with your friends or thousands of other players online, then hop on into Full Metal Monsters and see for yourself just how crazy battle matches go in every arena. The game sets you to have command over a large number of metal monsters, in the form of dinosaurs, and battle with a team of 5 people against a loosely similarly capable players in an arena. Win or lose, you can still gain rewards but the better you perform in each match, the more rewards you get. Each match you participate in earns you experience points to level up your account and every new level you reach unlocks new metal monsters and guns you can use to customize your mech dinosaurs. Each metal monster can be upgraded to boost stats and additional riders can be purchased as well. As you unlock and upgrade more and more dinosaurs, you will naturally need more resources to keep yourself competitive. As it is expected that no two matches will be the same, it is important to keep your wits about and have a wide array of battle tactics at your disposal as you battle it out in the arena. The first few minutes you spend with Full Metal Monsters will take you through a series of tutorials to teach you the basic controls and mechanics of the game. Truthfully enough, the controls and game play are fairly easy even for total beginners. In just a few minutes, the tutorial will end and you will be sent to battle immediately and will involve random players as enemies making it as challenging as any other match you will be joining in subsequently. Don’t worry about losing, though, as every match serves as learning experience and you do get something out of it whether you win or lose. If you find yourself still at the losing end of a series of matches despite best effort, or if you are racking up some wins every now and then but still want to improve your performance, then our Full Metal Monsters guide, including tips, cheats and strategies, can help you dominate your opponents and earn better rewards each game. As you will be able unlock new metal monsters as you reach new levels, either for free or thru paying D-crystals, be sure to test each one out in battle before you decide which one to prioritize with regard to spending upgrades on. Keep in mind that each metal monster is unique and their uniqueness goes well beyond each one’s distinguishing looks. Each metal monster has 4 basic stat attributes: HP, Speed, Damage, and Range. 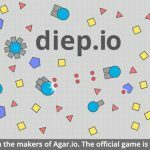 HP determines defense and the higher it is the more hits your dinosaur can take. Speed reflects movement speed which also influences mobility and can be advantageous both from an offensive and defensive stance. Damage determines the strength of your firepower and also melee close-combat attacks. Last but not the least, Range determines the maximum distance your bullets can reach. Naturally, each metal monster has a unique set of stats and the variance grows as well with each upgrade. It should be worth your while to check each metal monster’s base stats before you use them in battle although the actual experience of using them in battle will give you a much better idea of their strengths and weaknesses. Take note as well that some metal monsters that you can purchase using D-crystals have two defensive stats which can be a combination of any 2 of the following: HP, armor, shield. As such you may want to save E-cells for when you have already purchased on of those “elite” metal monsters. In any case, these metal monsters are sort of like beefed-up versions of the ones that you can unlock for free and you will get easily accustomed to them if you have used their normal counterparts in an actual match. Like the metal monsters you use in combat, there are wide varieties of armaments to choose from in Full Metal Monsters. Each one has its own unique stat attributes as well which is based on damage per second or unload time, reload time, capacity or number of bullets and range. Again, while these stat attributes that vary from one gun to the next is useful enough to know, equipping them and trying them on the battlefield first-hand will give you a much better idea which ones qualify as your weapons of choice and make it easier for you to focus upgrades on a couple at least. Strategically, you may want to complement your metal monster’s own stats with the stats of your preferred weapon like banking on range if you prefer staying as far from your opponent as you can or going straight for damage and be a bit of a glass cannon. In any case, feel free to choose a pair of weapons that suit your preferences and play style. Dinosaurs you bring into battle don’t act all on their own as each one requires a rider. If you happen to get killed in battle with only 1 rider, therefore, you won’t be able to participate any further. As such, it is very important and highly advantageous to invest some D-crystals to purchase additional riders. Although succeeding riders cost more than the current one, having 4 or even 5 riders is still relatively cheap. This doesn’t only mean getting additional chances to join the fray and turn the tide of battle to your team’s favor but as you can also choose another metal monster on every respawn, adjustments can be made on your tactics which can also set in additional advantages for you and your team. Keep in mind though that having more riders than unlocked metal monsters will be futile as you can only choose each dinosaur once per match. This may stem reason for you to also upgrade the other metal monsters you would like to use as secondary and succeeding choices in battle but then again, focus should stay on the upgrade of your main metal monster of choice. Going into battle opens up a lot of unpredictability as you will not have an idea about what your team and the enemy team consists of and you will also go initially blind as to each player’s skills and abilities. As such, it’s a definite no-no to go all-out offensive on your own as you follow the closest path towards engaging an enemy player or players. Keep in mind that one good sign of a beginner level player in your team is someone who seems to keep straying off and you may not always be able to stay close to everyone; staying close to where most of the team is would be the next best choice. 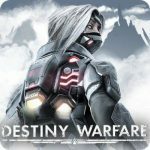 It’s highly likely that encounters won’t be a one-on-one fire fight as it is very typical to see players move at least in pairs if they are at least intermediate level players. Depending on how good you know you are, try and focus on staying with any team mate while also scoping around for enemy players. Remember that keeping as close to your team as you can raises not only your survivability but also your offensive capability. So make the best effort to follow, if not lead the team towards a more coordinated battle. For one, you can definitely outgun and overpower any single enemy you encounter and manage to kill him even if he’s stronger than either you or your team mate. From a defensive play, you or your team mate who is currently being targeted by an opponent can perform evasive maneuvers while the other can open fire freely on the enemy. These are just basic strategies you can impose on the battlefield and there are more complex ones you can learn and discover as you play and get better. Your performance in each battle you join in as you play Full Metal Monsters doesn’t depend entirely on how good you are at hitting targets and going on the offensive. About half of what it takes to dominate in each battle rests on how good you are on the defensive aspects of every encounter, particularly jumping out and away from the line of fire or into walls and similar obstacles to hide from the enemy’s line of sight. As an example, the jump ability which can get you close to your target might be initially perceived as an offensive skill. In truth though, and especially considering its cooldown period, it is best saved for emergencies like if you are under fire and will most likely lose to an opponent in combat. For best results, always keep an eye out on the cooldown period so you will always know when you can afford to jump and bail out of a confrontation if you are at a disadvantage. As you should also be able to see the enemy’s HP meter, you should only use the jump skill for a more offensive purpose if you are chasing an enemy down whom you can kill if you close enough the gap or gain sudden line of sight following the use of the jump skill. Most especially if you are having difficulty aiming manually, clicking on the Lock Target button at the bottom right side of the battle screen brings only advantages and none of the disadvantages in the game. It’s an auto aim that will always make you hit your mark as long as there are no obstacles or any sort of impediment in-between. This actually makes it almost too easy to continuously pour on the assault on anyone especially since the lock target option follows even the fastest movements any metal monster can make. As the lock target feature will select the enemy closest to your crosshairs, it may not always pick the most viable target at all times and as such, click on the “Next Target” button to shift focus on another target. You can also choose to unlock a target and you may want to do so if you are on the defensive position and would want to freely scan your surroundings. Despite having random battle locations and spawn points, playing a lot of matches in Full Metal Monsters will have you replay all the stages you have fought in before. Although the primary focus of your concentration should be on your team as well as enemy players, make an effort to familiarize yourself with the lay of the land. It will definitely take some time for you to be fully familiar with each arena layout, but the sooner you get a good grasp of it, the better your performance in battle will be both offensively and defensively. Be sure to take note of good choke points and ambush points as well as hiding spots that are scattered across the map. Although battles initially set opposing teams on distant starting areas, it’s possible for your enemies to come from all sides as the battle rages on. As such, be sure to remember areas where you can avoid being pinched into a tight corner and also places in the map where you can launch surprise attacks on unsuspecting opponents. Advertisements have always been a part of many free-to-play games and, most especially in the mobile gaming industry, has been a generally acceptable trade-off for the fact that a huge percentage of games can be played and enjoyed without spending any money. If you are relatively new to mobile games and still find ads annoying, then we hope you realize that these advertisements keep the game running even if most users won’t spend money on purchasing in-game premium items. Although video ads pop up at the end of some matches without giving you an option to skip it, all other video ads in the game are actually optional to watch and provides rewards that would actually make you want to watch them as much as you can afford to and if you aim to get stronger faster in Full Metal Monsters, then watching these short video ads is a must for you as it can greatly contribute to boosting your metal monsters’ growth as well as the enhancement of your weapons which all ultimately takes you that much closer to dominating the battle arena in succeeding attempts. For one, you may be given an option to watch a 15 to 30-second video ad to double the rewards that you can receive after each match and double of anything is surely something that any player would want. As metal monster upgrades and weapon upgrades take time to complete, you can cut the waiting time by 20 minutes with every short video ad that you watch. Keep in mind though that as the upgrade level goes higher, so too does the time it takes for the upgrades to complete so you may want to do this while watching a movie or something. One of the best set of perks to get out of watching video ads comes from the market when you choose to click on the plus icon beside either E-cells (basic currency) or D-crystals (premium currency) when you need more of either. You can receive wither 20,000 E-cells or 12 D-crystals with every short video ad you watch at the shop so be sure to do this as many times as you can. There is a cooldown period that starts up after claiming about 5 rewards so try to take note of it as well and log back in once the countdown timer reaches zero. Well, that’s everything we have for you as far as our Full Metal Monsters beginner’s guide is concerned. As a final and general tip in addition to the list of items we shared above, consider the first hour of gameplay as a study and training part and don’t play exclusively to win on the first few matches. We hope that you found the tips and strategies we shared to be enlightening and likewise entertaining to read. If there are additional tips and strategies you have uncovered and would like to share your views about this game with us, we would appreciate hearing from you so be sure to let us know of what you think by sending us a message through the comment box below!